In 1961, Raymond Cooke took over the Nissen hut used by wartime company Kent Engineering & Foundry in Maidstone and started to produce loudspeakers that were branded KEF. And the rest, as they say, is history – the company has become an industry stalwart and the visionary speaker designer’s awesome body of work has been imitated by others. The latest of its doctorate designers with lots of letters after his name is responsible for the eleventh – yes, eleventh – iteration of KEF’s famous Uni-Q coaxial transducer. That Dr Jack Oclee-Brown, PhD, MEng, looks like he still does not need to shave much merely makes me feel old – I first enjoyed KEF's Reference speakers back in 2008. Since then, the line has been revamped, further developed and taken to another level of potency. The new range actually launched in 2014, but at first was a hi-fi proposition only. Production of the all-important centre channel speakers didn't begin in earnest until after KEF had satisfied the demands of those who had pre-ordered its floorstanders and standmounts. This is why I found myself in Maidstone yet again. Last time I visited I literally raised the roof and frightened KEF's receptionist, as the demo room is close by the entrance. This time I was relieved to find that the receptionist wasn't there. And I had to head to Maidstone because KEF's Reference speakers – especially those auditioned here – are sizable enclosures, and a review just wouldn't have been feasible in my abode. I've made similar trips to listen to Focal's Utopia range and a JBL Synthesis system. As always, I must stress that my listening took place in a professionally treated room – a room, in fact, that now houses four of KEF's Ci200RR-THX in-ceiling speakers. This is like a shop ceiling speaker, in the way that a moped is like a Maserati. At ‘only’ £450 each, these nine-inchers (with a Uni-Q driver in a shallow box, using the ceiling itself as the ‘enclosure') did an astonishing job of putting the lid on the Atmos system I was to experience. But more on that later. What I had to listen to was a sumptuous statement of loudspeaker luxury. The revamped KEF Reference speakers are objects of profound craftsmanship taken to artistry, and with a timelessly classic look that belies the intensively-developed and human-ear tested research under each shiny exterior. They come in choices of finish so pretty it’ll be a struggle for buyers to pick one. First is, of course, an ultra high-gloss Piano Back (with silver fronts), which is photographed here. Then there are pair-matched veneers of Satin American Walnut or Luxury Gloss Rosewood, both wearing multiple-layered lacquer. And then there are two special Kent Engineering & Foundry Editions – Blue Ice White and Copper Black Aluminium – which not only redress the sides but the front face, too. That last is so gorgeous it hurts. The array here is probably the most premium that KEF can assemble and anyone would ever install. It comprises a pair of the £10,500-per-pair Reference Model 5 floorstanders on front left/right duties, with the sideways behemoth that is the Reference Model 4c as the centre channel enclosure. The Reference Model 3 towers are used as surround and rear channels. As befits a high-end setup, there are two subwoofers (the Reference 8b); smart designs employing dual 500W amplifiers and twin 9in bass drivers arranged in a bipolar configuration. As far as premium subs go, they appear almost petit, yet weigh in at 35kg each. A fantasy system, then, yet the good news is that KEF's Reference range certainly allows for scaled-down setups for those with smaller rooms and budgets. Use the Model 3s up front, opt for the smaller 2c centre, a pair of Model 1 bookshelf speakers for the surrounds and a single 8b woofer and you'd arrive at a 5.1 system still of serious potential. 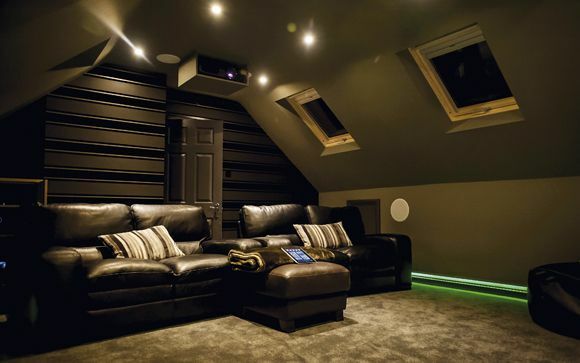 This setup was £38,000 worth of loudspeakers (£39,800 including those four in-ceiling models). And that is not to count the Chord speaker cables and interconnects, Arcam processing and heavyweight Arcam two- and three-channel component amplifiers used to offer monstrous headroom. One of the cleverest things about KEF's Reference line – and this multi-speaker system – is that the same two (well, three) transducers are used all around, which brings with it benefits in tonal cohesion. The 11th-generation Uni-Q has a 1in aluminium tweeter at its centre with a 5in midrange transducer in perfect synergistic harmony; the high-frequency unit using the rest of the driver assembly to disperse its sound coming from the tangerine wave guide. And this acoustic science is at the heart of each Reference speaker – literally, when you consider where the Uni-Q's are sited on the front baffles. The loudspeakers then wear one, two or four of KEF's new 6.5in bass drivers. Again, these use aluminium for its rigid and light properties, and the shallow discs attach to their large diameter voice coils via a vented coupler, and innovation trickled down from KEF's Blade speaker. And the cabinets themselves have been thoughtfully designed, braced and damped to eradicate colouration or other sonic nasties. So what’s it like? How can a speaker system cost forty-thousand pounds? By using objects crafted with exquisite attention to detail; by having huge man-hour counts under their phenolic resin composite baffles; by having every single part listened to as well as electronically modelled before construction; and, most of all, for performing like paragons. I sat down to listen feeling deliciously guilty at the fact that this was my job. First, KEF insisted on running through a few demo Blu-ray tracks from Dolby to demonstrate the system's capabilities, including an audio-only one of a helicopter moving around that was so bad it was funny, from a pure sound design point of view. Not to worry: I called up the opening sequence from Angelina Jolie's Dolby Atmos-flavoured war-tinged drama Unbroken, where the American bomber planes encounter 'ack-ack' fire and a swarm of Japanese Zero fighters. The experience was of surround sound power and impact the like of which I have never experienced before. I have felt louder, even though this setup was able to go to extreme levels, yet the sheer insanity of the dynamics was linked to a beauty and poise. With Unbroken, the anti-aircraft fire was terrifying, the Zeros' bullets whizzing through the air were divorced from any cabinet locational cue and I ducked a few times involuntarily. I was more ‘there’ in the action than I'd ever imagined. The soundfield just wasn’t coming from the Reference speakers – it was literally all around me. I got goosebumps. It's the kind of performance that really immerses. For instance, when the Zero flies at and underneath you, past the broken bomb doors and strafing as it comes, I all but leaped off the comfy sofa, lifting one knee off the floor in case I got shot. A comparison of the full Atmos system versus 5.1 was insightful – the 'flat', semi-skimmed system still impressed with a level of performance that I'd say any owner would be happy with. KEF's Reference models dig out detail so epic that you'll hear things in soundmixes you hadn't been aware of before. Back at 7.2.4, and Alfonso Cuarón's Gravity (Blu-ray) further proved the system's high-end merits. This film frightens me, over and over, and from its very beginning in Atmos it's literally breathtaking. Most of you will know the sequence. It starts in orbit, with a text crawl about how sound doesn’t travel in a vacuum, accompanied by a crescendoic swelling tone that gets bigger and bigger and stops abruptly, leaving just radio chatter from the astronauts that we're drawing closer to. That overall 'whoosh' of lossless audio gets far louder than you think it will and there's always the danger of the soundstage seeming congested, and the speakers making a general row. But the Reference resolved this tricksy audio without the harshness that hard domes can do, and with the snap and dynamic attack that seemingly only massively-gripped aluminium cones can manage. These drivers can stop hard, and the very instantaneousness of that halt leaves you gasping. And then there was the wittering of Houston and George Clooney and Sandra Bullock. Crystal-clear but slickly located behind me and to the right, before the POV moves in a manner to emulate how nauseating free-fall actually is and the sounds of the radio operators swirl around seamlessly. The soundfield, with those floorstanders attending behind me, was seemingly gapless. So while the sheer scale of the system seems without limit, sonically everything is utterly clear and clean, and capable of brilliant intimacy. Moving to a gunplay-heavy sequence from Jupiter Ascending also bore that out. Copious detailing and massive impact were in evidence at the same time. Gravity’s drop from loud to soft is, I think, the biggest dynamic gap test in our world right now. And the bottom end is also abused by the sound designers, with use of huge bassy tones to add fear (the film also features some nasty high-pitched whines to put you on edge). The 8b subwoofers come into their own here. Rated to reach comfortably down to 18Hz, they exude depth, scale and slam. Yet perhaps the best test of the system's overall low-end output was not the huge and fear-inducing LFE wobbles that Hollywood is so in love with, but rather the control, leading-edge accuracy and speed required to deliver the performance of an acoustic jazz bass. Legends of Jazz on Blu-ray is a great platter for these occasions, specifically Jane Monheit performing They Can’t Take that Away from Me. The recording was simply beautiful to listen to. The musicality of these speakers and their almost invisible nature will delight any audiophile, and that bass was cohesive, rich and taut. So should you invest in The Reference? I'm not your bank manager so I can't make that decision for you. All I can say is that if you want true top-end performance and to enjoy owning loudspeakers, then these are a new high that can compete for output with rather more industrial-looking products, yet exude such design presence that they will make a statement. As objects, they are lush to behold, and incidental details, such as the rotatable terminals that easily allow single- or bi-wired hookup and the heavy steel bases with spikable outriggers, add even more pride of ownership. You will need to want to use the system a lot to justify the cost, but you can spend way more and get merely brutal. This system is British surround high-fidelity at the utter state-of-the-art. And it's easily worthy of its Reference name.